What the devil!? Shocked by the power of this competition? 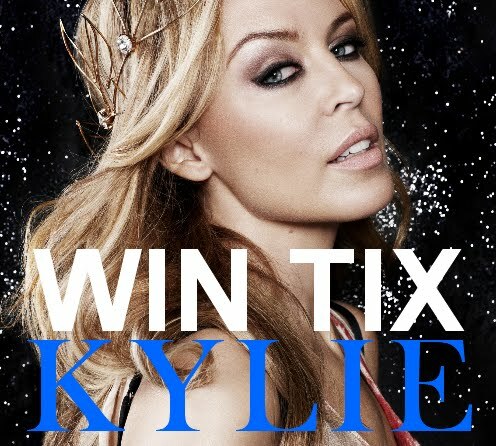 Put yourself in OUR place… when the fab teams at Warner Music Australia and Frontier Touring came knocking in some kind of blissful surreal moment, asking us to give away double passes to three of Kylie’s forthcoming concerts… well we could hardly breathe. Yes, Kylie Minogue is heading our way early next month for the local leg of the ‘Aphrodite – Les Folies’ world tour, complete with breathtaking state-of-the-art staging including the now infamous ‘splash zone’. All the lovers of KM who’ve seen the show already have labelled it hands down the best Kylie show ever – a pretty big call, but from all reports not unwarranted. As you’re aware, tickets are now on sale for the final few shows (all dates below). But we’ve got three gold double passes to give away… And you have the chance to win them! Yes indeed, with thanks to the ebullient and smashing teams at FRONTIER TOURING and WARNER MUSIC AUSTRALIA, we have a gold double pass to the Brisbane show on Saturday June 04, a gold double pass to the third Sydney show on Saturday June 11 and a gold double pass to the Melbourne show on Thursday June 16! Yeppers – three golden doubles to give away to you! It’s too much! And as always entering any auspOp competition couldn’t be easier! Email us at auspOp@ymail.com! Include your name and postal address, an emergency contact phone number and the name of your favourite Kylie single. Place in the header which draw you’d like to go into (i.e. “KM – Sydney” for the Sydney concert, “KM Melbourne” for the Melbourne concert or “KM Brisbane” for the Brisbane show)! Do that and you’re in with the chance to win one of three double passes, valued at up to $300 each! Wow! If that doesn’t bring you finer feelings, we don’t know what will! Keep your eye on the Frontier Touring website in the days ahead for details of an exclusive competition to meet and greet our pop princess during her tour. June 16. Travel to/from the event, refreshments and all other associated costs are the sole responsibility of the winners. This prize is for the tickets ONLY. And as always, we’re rather fussy when it comes to your privacy, so none of your details are forwarded or passed onto any third party unless previously advised. THIS COMPETITION IS NOW FULLY CLOSED.